Have you all caught your breath now that Black Friday/Cyber Monday have passed? I know my inbox needs a little detox for sure! I did manage to snag a few goodies and get a few things checked off of the kid’s lists, so at least the ball is rolling! I’m a sucker for a good fairisle sweater and with winter on it’s way I figured it was time to stock up! At $20, this one was a no-brainer and I have gotten a ton of compliments on it. 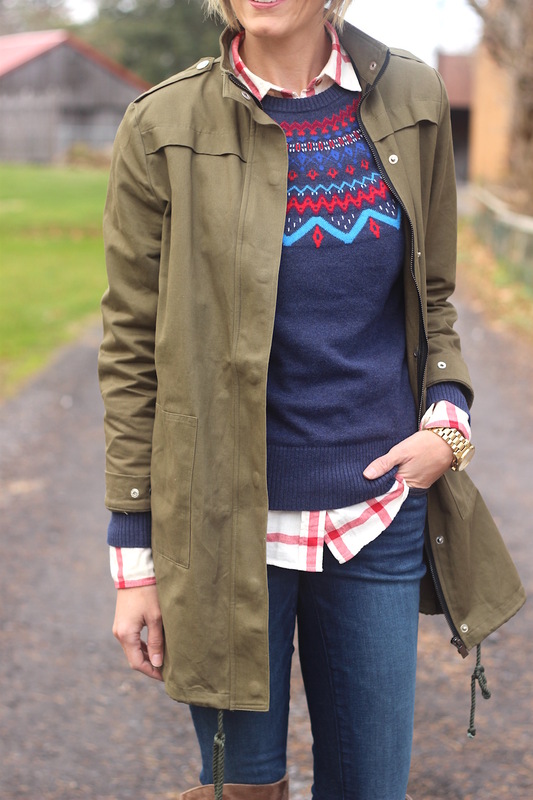 I sized up so I was able to layer under it and love the look of the plaid underneath. There are a number of colors available that you can check out here. I’m gathering all of my favorite sales and will be updating all throughout Cyber Week, so be sure to keep checking back to catch all the best deals!! Amazon: So many great deals, especially for Prime members!! I also want to wish you all a wonderful Thanksgiving and safe travels for those of you that will be on the road or in the air. I’m so thankful for all of you!! I’m sure there are more than a few of you that have begun the task of holiday shopping, so today I’m jumping in to the fun and sharing my first gift guide of the season. I’m starting with the easiest in my opinion, her gift guide, because it’s basically a guide of my own ;) Scroll down for all the details! 1. Kate Spade Hat: Put a bow on it and you have me…how stinkin’ adorable?! 2. Sole Society Weekender: I love a good weekender and this one is such a stunner! Sleek and sophisticated and a available in a variety of colors. 3. 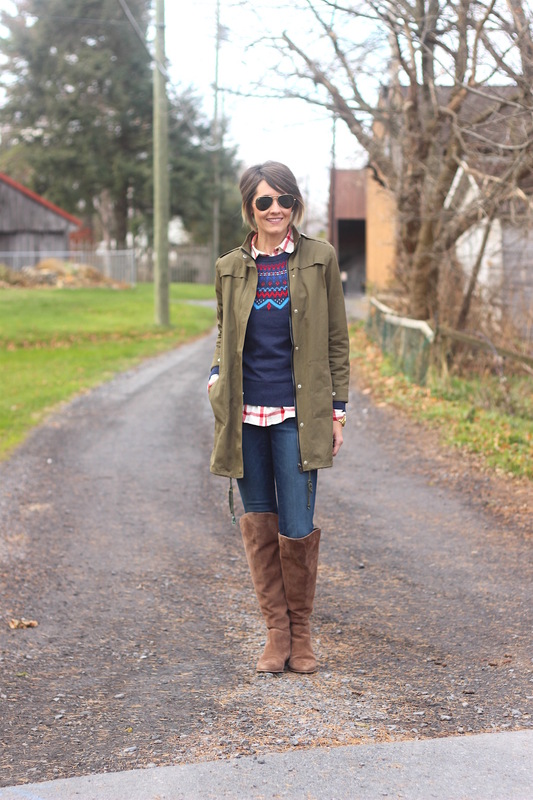 Hunter Boots: These boots are the best. Rain or snow, they’ve got you covered and looking oh-so cute as you face the elements. The only down-side is narrowing down a color! 5. Madewell Slippers: Im always due for a new pair of slippers come the holidays. These seem too cozy to pass up! 6. Kate Spade Thermal Mug: Tuck in a Starbucks card and you’re set! 7. Too Faced Neutral Eyeshadow Palette: I love palettes such as this one. The best part is that they work for everyday make-up but can also be used to take it up a few notches for a night out or holiday party! 8. J.Crew Dreamy Cotton Pants: These have been my favorite pj pants for years. I always watch for the sales this time of year to stock up on a pair or two. 9. 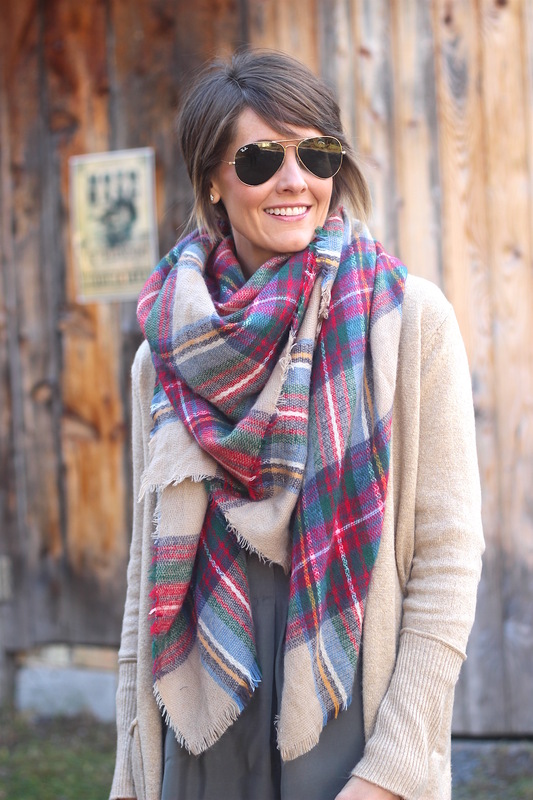 LOFT Faux Fur Infinity Scarf: A great staple to have all winter long for any woman in your life. 10. Prayer Journal: I recently gave this to a friend for her birthday and now I’d love to have one of my own. A place to keep my on-going list of prayers in order and close at hand. 11. Voluspa Candles: These make great stocking stuffers or you can add them to gifts you’re working together for your friends, family, teachers etc. One gift you can guarantee to be used! 12. Stella & Dot Engrave-able Necklace: A personalized gift always shows that you put time and thought into it. This sleek and stylish necklace would win any lady over. 13. IT Make-up Brushes: I’m in need of a new set of brushes (husband, if you’re reading…stocking stuffer ;) I bet I’m not alone in needing this update and I’m sure many of your girlfriends would be thrilled to have this gifted to them! 14. Sole Society Tote: You all know my obsession with my Madewell tote, and I came across this option at a more budget friendly price. Sleek, stylish and a gift that would certainly be well used! 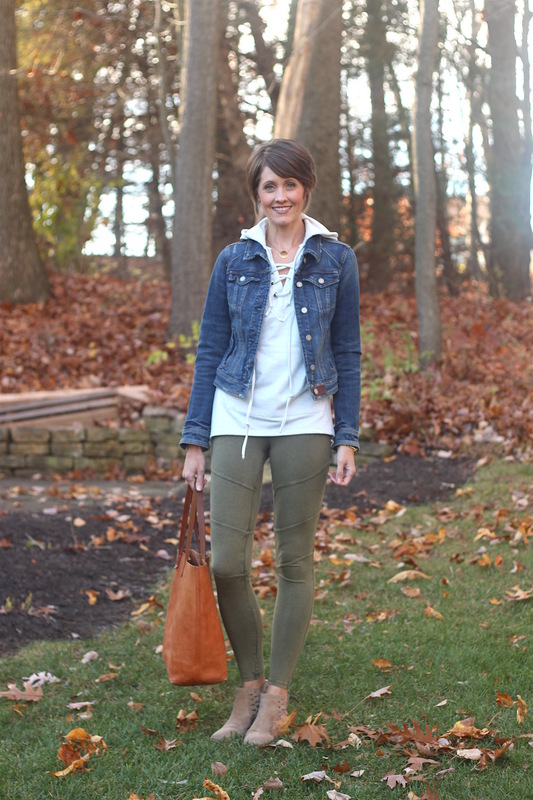 We’ve been enjoying quite a beautiful fall season around here and I’ve been making the most of my lighter layers and ankle booties. Oh, and the colors! The rich beautiful colors that I can’t get enough of! This pretty top reminds me of something that I would find at Anthropologie, but I grabbed it straight off the rack at Target. It also comes in blush which you know is right up my alley as well. 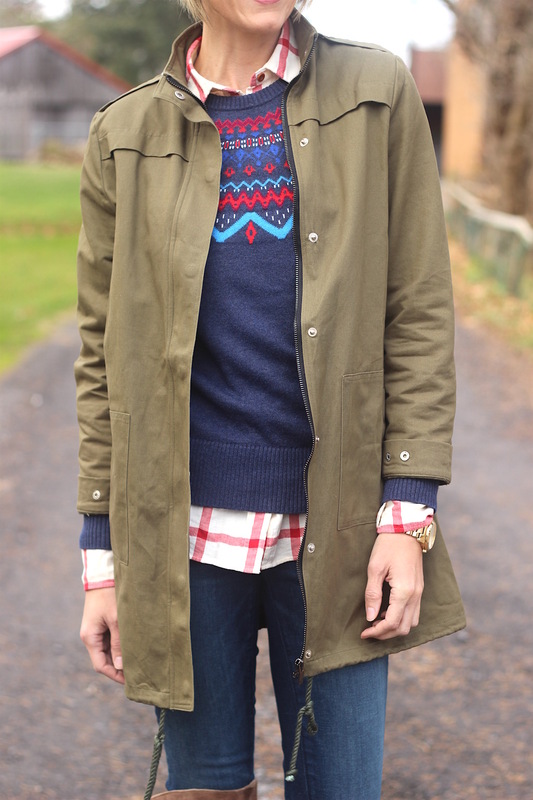 And this jacket is another great piece at a great price ($30!). I love the length and the fact that it’s roomie enough to layer sweaters underneath. That’s important, because I’m not ready for wool or down just yet! Hi Ladies! Not my typical style topic today, but one of much importance when it comes to creating your own personal style and feeling your best. Over the past few years (well, seven actually), I have been pregnant, nursing, trying to regain my body again (although those of you that have given birth know that that old body is pretty much gone) and then back on that cycle three more times. To say my body has changed is an understatement. Sure, weight has been gained and lost, muscles have been gained and lost, and my chest has gained and well, lost for good! I’ve now reached a point where none of my old bras fit the way they used to and I don’t have any plans to jump back into any nursing bras (gosh, they’re the worst!). I have tried a few within the past few months but I have yet to find one that has the fit and support (or shall we just call it lift) that I’m looking for. I’ve recently been hearing and reading a lot about ThirdLove and their collection of bras that are designed with you in mind. One of the best features, in my opinion, is that they offer half sizes! I’ve had so many issues going between cup sizes and just like shoes, I don’t know why this isn’t always an option! When it comes to your size, they actually have an app that you can download on your phone that lets you take pictures for them to measure and accurately give you your bra size. I was assured that no images would be saved anywhere, haha! Once you have your size, it’s on to style and more of what you’re looking to get out of your bra. Below you’ll find a Bra Personality Quiz from ThirdLove that fits right in to the fall season and will help to give you some sort of direction. I knew I was the Classic T-shirt gal before I even took the quiz, that’s just my style ;) I’m always up for a great neutral bra that will work under most any outfit. That makes getting dressed in the morning all that much easier. I have to say though, I’m not opposed to the Lace Balconette, and I’m sure my husband wouldn’t be either! I’d love to know what you ended up with?! Which bra suits your personality the best? Want to hear one more great perk about ThirdLove? You get a 30 day trial to find out if this is the bra for you! If not, you simply return it, but otherwise, they’ll wait to charge you at the end of your trial period. I can’t find a downside here! For those of you that are in my boat and are eager to find a perfect fitting bra, ThirdLove is offering a 15% discount to A Lovely Living readers! Simply enter code:TLNOVBB15 for your discount. I can’t wait to get mine and finally (fingers crossed!) have a great fitting bra in my life. For anyone else that gives it a try, please keep me posted. I’d love to hear how it works for you! 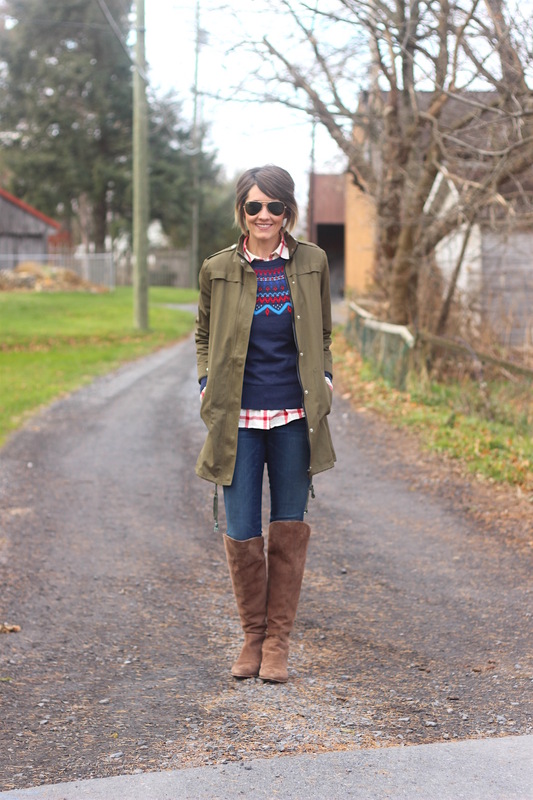 This is most certainly a top favorite outfit of mine this fall. Feminine and chic but so versatile at the same time. This can easily work for weekdays, weekends, church, brunch, and any host fall plans you have up your sleeve. 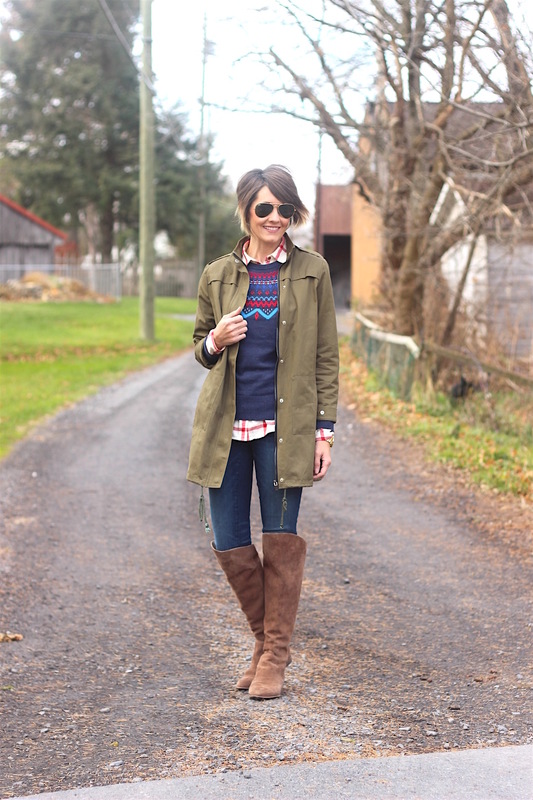 It may be a stretch for soccer mom, but hey, you’d be the best dressed at that game! Some pieces are new, most are older, but the beauty of an outfit like this is that you can mix and match pieces from your own wardrobe and it’ll all remain in style for years to come! Well this week certainly flew by! I’m sure with all of the election commotion that you’re all just as ready for the weekend as I am. And I just may have to break out this ensemble again all too soon…..as in tomorrow ;) Easy, cute and comfortable, what’s not to love? 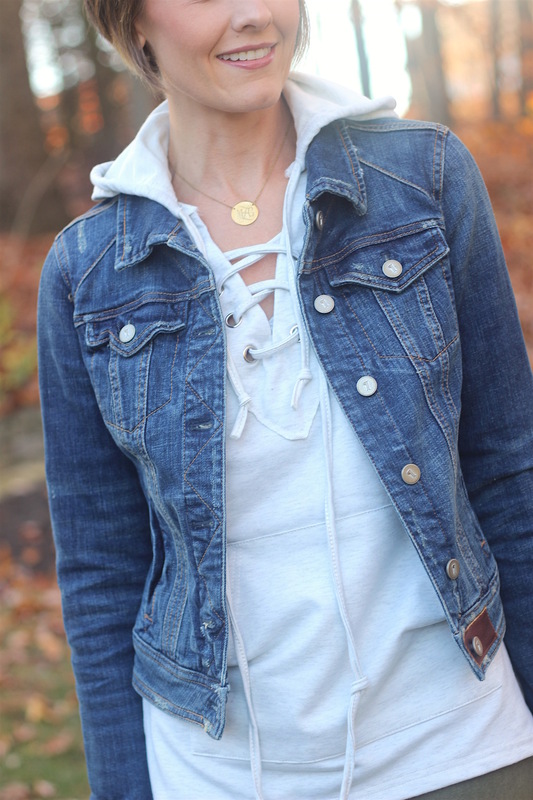 There are so many cute lace-up top options at the moment (I know I’ve shared options previously), and this one in particular is only $18! You can find them in the form of shirts, sweaters, tunics etc. All of which look great with leggings and a jacket and it serves as the perfect outfit for running errands, gathering for brunch with friends or soccer games with your children. Trust me, these are great go-to pieces to have on hand. I don’t typically post on Thursdays, however I’m making an exception and squeezing in this extra post so that I can share some of my favorite picks from the Nordstrom Fall Clearance Sale with you all. Quite a few of my go-to fall pieces are included, so if you’ve had your eye on anything, now’s the time to pull the trigger! 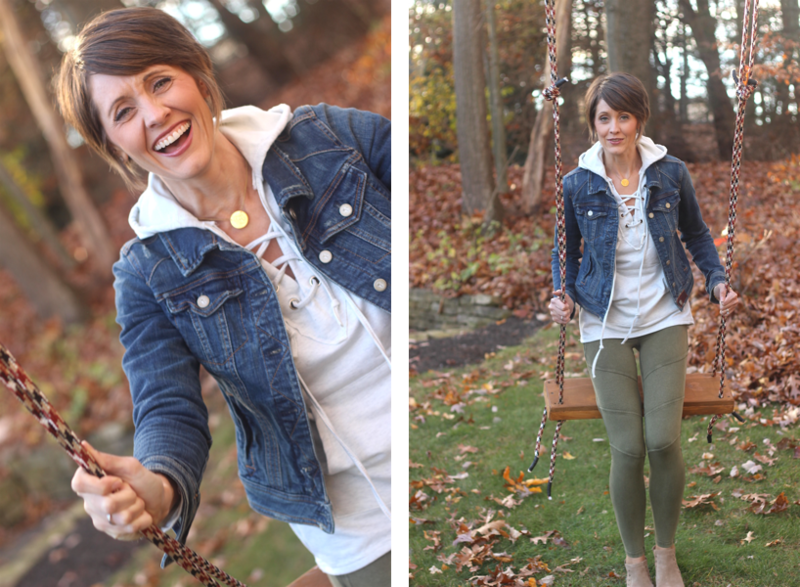 The Bobeau cardigan that I’ve raved about is now $40 and comes in a ton of colors! I have a number of beanies, but if I needed an excuse to grab another one, this cashmere one would be it. The same goes for denim, I love AG and I’m looking for any good reason to get this pair. You all know how I adore my Madewell tote, but if you’re looking for something a bit more budget friendly, this one is now marked down to $32! And finally, the ankle booties and OTK boots you’ve seen me wearing all season (examples here and here) are also marked down and most sizes are still in stock! If you have some free time, you should do a little browsing of your own because there are a lot of great fall to winter pieces to check out! I believe I have mentioned on here before how I love to change up bedding in our home. For those of you that own duvets, you know what little space the covers actually take up. In my mind, that gives all the more reason to keep a few on hand to switch in and out with the seasons or as you see fit. With the holiday’s rapidly approaching, I know many of you have plans to welcome fiends and family into your home. With that being said, I wanted to share with you today some bedding options from Vaulia Home Collection that you could use as a quick way to update your guest room and keep within a budget too (all sets shown are under $30)! Following are a few of my favorites, but you can check out their entire line of duvet covers here. Classic and beautiful. I think navy is such a beautiful color for a bedroom and tied with florals, I’m all over it. Soft and serene. I can’t tell you how much I’d enjoy walking into a guest room with this bedding (or my own room for that matter!). So crisp and welcoming, I’m not sure I’d want to leave! And picture all the navy and rust accents you could work into the room…oh the possibilities! Fun and modern. I adore the print and colors in this ensemble. It has such a cheery, youthful vibe, I could see it working well in a child’s room as well! You’re bedding is typically the focal point of the room, but by tying in a few accents such as a throw, a couple of bedside lamps and a few accent pillows, you’re guest room can be refreshed and updated in no time! *Thank you to Vaulia Home Collection for sponsoring this post. All thoughts and opinions are my own.